Open Source Initiative (OSI) approved licenses, like Sourceforge, or they only accepted one, like the Free Software Foundation's Savannah project, which only accepted GPL'd projects. We've added an option to the license selector to allow any project to use an OSI approved license. 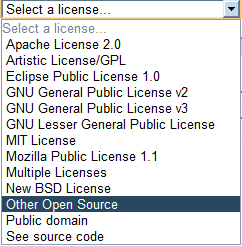 Simply select “other open source” and indicate in your LICENSING, COPYING or similar file which license you are using. With regard to the public domain, the Creative Commons CC0 license now provides a (presumably) legally robust mechanism for releasing content to the public domain, or at least the closest thing possible in certain countries. Why doesn't Google also offer hosting for non open source projects? Wouldn't this go hand in hand with App Engine for business etc? Do you know what would be killer, Google Code for Google App and allow private projects. Nice, but how about actually working on the site. There are highly ranked issues that hasn't been implemented in YEARS. Google code has a derelict feel to it. @Jacob - We're actively working on resolving those issues. Over the last year our priorities have been reliability and latency. That, admittedly, has taken a lot more of our time than we would have liked. We've also spent a huge amount of time supporting Google Open Source projects such as Chromium, Android, etc. As a result, we've made more progress in areas like the issue tracker and less in other areas. (example: https://www.ohloh.net/p/idemauth/analyses/latest) combined with a simple algorithm to detect incompatibilities... shake it, et voilà: coogle code has a selectbox to select licenses that offer to the lazy developer just the possible alternatives. Think seriously at this if you want to reach consistency in the google code licensing jungle! "You will be presented with a choice of Free Software licenses for your project. For hosting on Savannah, you must use one of these licenses. You will be the copyright holder of the text you write for your project, but these licenses give the freedom to anyone to use, study, copy, and distribute the source code and distribute modified versions of it. For manuals, we allow only GNU FDL version X or later, or other licensing which is compatible with that. If you wish to use another license that is not listed, let us know and we will review these requests on a case-by-case basis."